A tallish 23-year-old lad plonks himself down on a seat. Headphones in, trainers on (called ‘crepes’), Armani jeans, and a jacket that just covers his LandWorks t-shirt. He inadvertently makes a weird noise (borderline Tourette’s, it just blurts out) that sounds like a fast rhythmic drumming, beatbox. But not before saying quite loudly and cheerfully, ‘Good morning’ to his new travelling companion and generally to anyone interested. Beatbox, who clearly can’t hear anything, certainly is not interested in his new neighbour! The train rumbles along, heading to Totnes and destinations afar. Smiley is nodding his head in time to something or other whilst Beatbox is randomly emitting his percussion noise (perhaps not quite as cool as he thinks). Anyway it’s getting warm and Beatbox decides to remove his jacket; a bit of a kerfuffle involving wires and phones, and Smiley gallantly offers to help but just gets glowered at. Smiley is now staring intently at Beatbox’s chest or at least the shirt logo and suddenly exclaims, “Wow, oh great! You’re heading out to LandWorks”. From the look on Beatbox’s face, it’s very likely he is about to say something involving the letter F and the word off! Totnes station is approaching; Beatbox is off to LandWorks but not before doing a rather special and especially complex handshake (signifying a new friendship) with Smiley, now officially a M8 who, it turns out, was one of last year’s art student placements at Quarry Field and today travelling home. 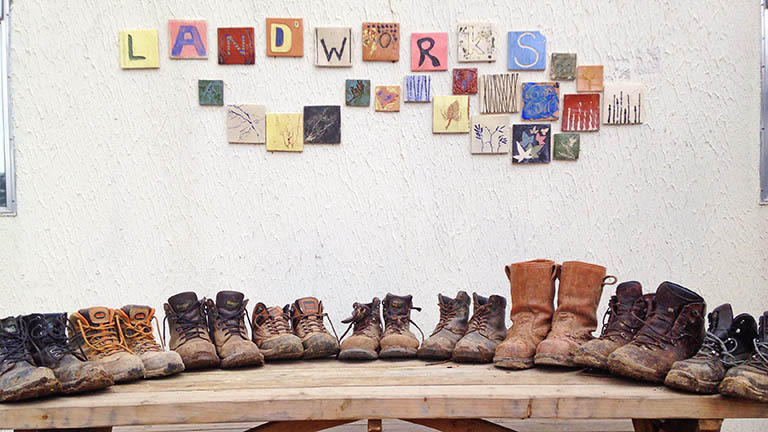 Out of the many things we do at LandWorks I rate our art students’ involvement very highly. Never quite sure why it works so well, it just does; amazing things are created but beyond this, relationships that would never normally happen, just do happen. Beatbox arrives at LandWorks and tells me, “Yo Chris, I met this poshy on the train this morning, I was going to have to tw*t him, but he knows LandWorks…he’s alright he is”. Then, making a special boom chaka boom noise, he heads off to change da crepes for da work boots.